There is a spectre haunting the Middle East and the rest of the world. A state fomenting violence in neighbouring lands. A state putting to death those who call for openness and democracy. A state which discriminates against women, gay people, Christians and various other minorities. There are reports that 50 people are imminently to be executed by this despotic regime. The behaviour of this state is coming under increasing scrutiny in the West. Something must be done, declare an increasing number of commentators. But what course to take? We could apply sanctions, squeezing this state’s ability to do business. We could form a coalition to demand change. We could threaten air strikes, or even troops on the ground. Or we could sell vast quantities of arms to this state and give it a seat on the United Nations Human Rights Council. Well, we surely haven’t taken the last option have we? I’m afraid so. Because the state in question here isn’t the vile Islamic State which is now terrorising large swathes of Syria and Iraq. It isn’t Iran, where hundreds of executions still take place every year. It isn’t Egypt or Qatar or UAE or any of the other autocratic regimes which also systematically abuse human rights. 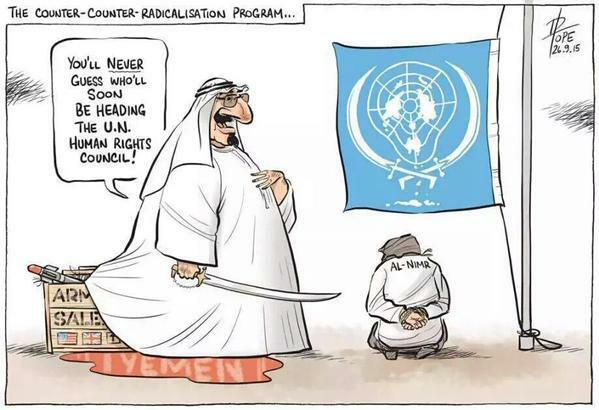 It’s our old friend and ally Saudi Arabia. Het zijn vrienden van de keununklijke familie;vandaar!Soort zoekt soort! Even worse: why do we invite millions of these barbaric Devils in our countries? Who are the real dombo’s here? Dat is altijd al geweest…….soort zoek soort en corrupte zullen elkaar dekken. Gotspe: de bakermat van islamitische terreur werd 14 eeuwen geleden in dat land gevestigd.